On March 17th, 2013, the filmmakers of '63 Boycott attended the workshop performance of an opera organized by the Civil Rights Opera titled "Shades of Mississippi", written and directed by Alan Marshall depicting the 1963 Chicago Public School boycott. The show at Christ the Mediator Church located in Chicago's South Side drew an audience of those who participated in the boycott of 1963, Chicago's largest civil rights demonstration. The filmmakers connected with many of these participants, along with the brothers, sisters, friends and family of participants. One woman in particular stood out, though. 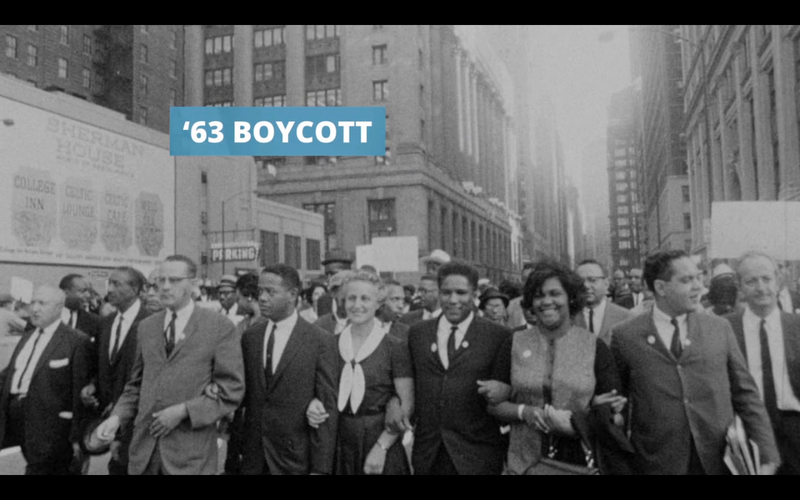 Taking an interest in the '63 Boycott booth, this woman recognized herself in an image taken from the footage filmed at the 1963 boycott. The goal of this film and website (www.63boycott.com) is to reach out to those who marched in protest against the Chicago Public Schools, and to show the similarities between racism in the school system in the 60's and the problems facing the school system today. Read an interview with the project director, Gordon Quinn, from the Austin Weekly News. He states: "even after the film is completed, we want the website to stand as a historical record of a time when people stood up looking to make a difference in their community. It must never be forgotten"
Did you or a family member participate in the 1963 Chicago Public School Boycott? We’d love to hear your story and see any photos, flyers, or pamphlets from the event you might have to share! We are excited to see any images you have and may be interested in interviewing you for the film. You may also email us directly at 63boycott@kartemquin.com or call us at 773-413-9263.